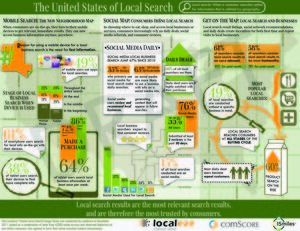 The Social, Local and Mobile (SoLoMo) revolution – fueled particularly by the rapid adoption of the tablet – now dominates the search landscape, according to the newly released Localeze/15miles Fifth Annual comScore Local Search Usage Study. The most significant findings revealed that as consumers rapidly adopt new devices and new methods to access local business information, online local listings are the most relevant and trusted search results. Click on the image below to get a better view of the infographic. Very interesting! The Localeze/15miles Local Search Usage Study was conducted by comScore in December 2011, based on a combination of data from 4,000 online surveys and observed behaviors of one million consumers who agreed to have their online searches tracked anonymously. Awesome graphic. Wish someone would do this for the UK market.